First Line: "There are so many ways it could have all turned out differently." Review: With all the hype around this book I went in expecting quite a bit but was surprised to see that it was mostly just a cute fluff read. 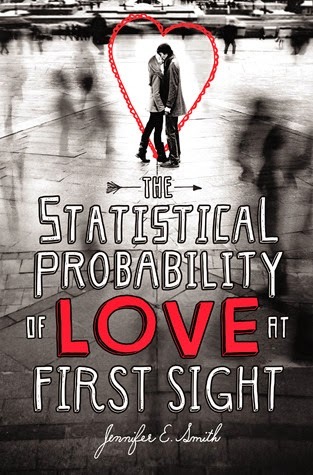 Also given the title The Statistical Probability of Love at First Sight I expected a lot more romance then what there was instead it was more about the family drama going on in Hadley's life with her father running off with another woman he met and her trying to forgive him. The budding romance between Oliver and Hadley was sweet I had no issues there, what I had issues with had to do with Hadley's mom and dad. I wasn't a fan of the mom for making Hadley go to a wedding she clearly did not want to go to and I was not a fan of her dad at all I hated how easily Hadley forgave him after what he did I expected her to give him a harder time. Overall this was a simple and quick read and I don't regret picking this one up although it probably wont be the most memorable of books that I've read this year so far. Memorable Quotes: ~“ In the end it's not the changes that will break your heart; it's that tug of familiarity."